Greetings, players of Shadow Era. 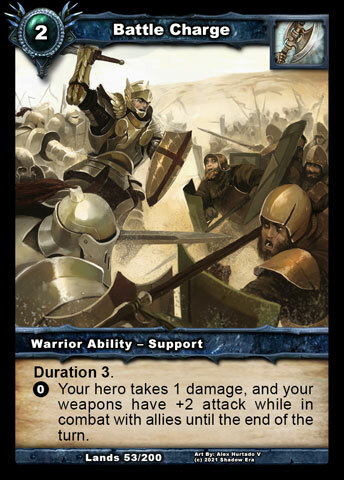 It's Gondorian here, Shadow Era TCG Head Designer, and I'm very pleased to welcome you to a new spoiler series for Lost Lands part 2, which will be focusing on each of our seven classes in turn, starting with seven new cards for Warriors. I would love to write more of an introduction, but I know you'll want to just skip to the spoilers, so I'll just list them right here in text form and then conduct the rest of the article afterwards. 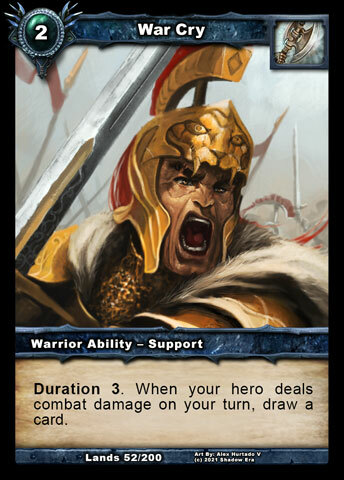 War Cry - 2cc Warrior Support Ability - Duration 3. When your hero deals combat damage on your turn, draw a card. Battle Charge - 2cc Warrior Support Ability - Duration 3. 0: Your hero takes 1 damage, and your weapons have +2 attack while in combat with allies until the end of the turn. Flurry of Blows - 2cc Warrior Ability - Up to 3 different target allies take 1 damage (or 2 damage if you control a weapon or armor). 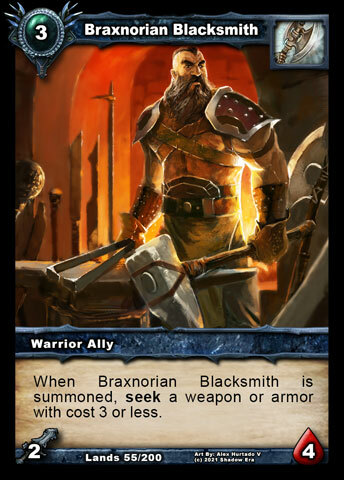 Braxnorian Weaponsmith - 3cc Warrior Ally - 2sword/4HP - When Braxnorian Weaponsmith is summoned, you may seek a weapon with cost 4 or less. 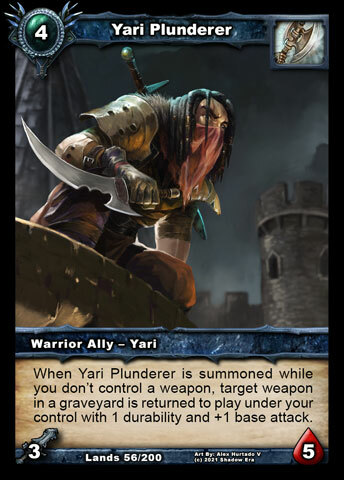 Yari Plunderer - 4cc Warrior Ally - Yari - 3sword/5HP - When Yari Plunderer is summoned while you don't control a weapon, target weapon in a graveyard is returned to play under your control with 1 durability. 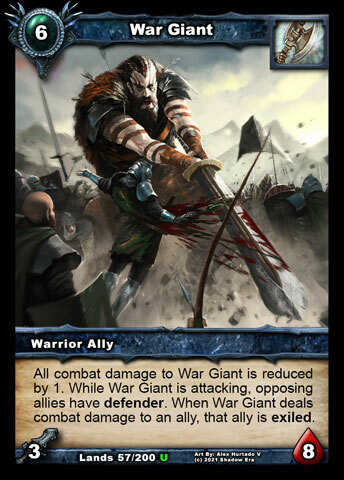 War Giant - 6cc Warrior Ally - 3sword/8HP - All combat damage to War Giant is reduced by 1. While War Giant is attacking, opposing allies have defender. When War Giant deals combat damage to an ally, that ally is exiled. Hopefully you can notice a strong theme there, which fits with your existing perception of what the Warrior class is all about. At the same time, I hope you can see each card adds something beyond what they already have access to without straying too far. Be sure to share your thoughts below after you've finished reading! But what about the seventh card? Well, as with all the new cards, we keep the needs of each hero in mind when designing, and we decided to devote one card slot to one hero particular. Can you guess who the following card is intended to help? 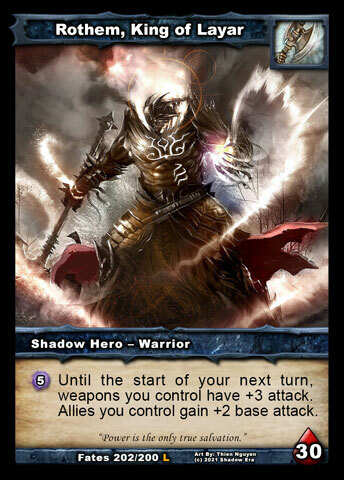 Chaos Engine - 2cc Warrior Artifact - When an item or support ability is targeted and destroyed on your turn, your hero gains +1 shadow energy and you draw a card. 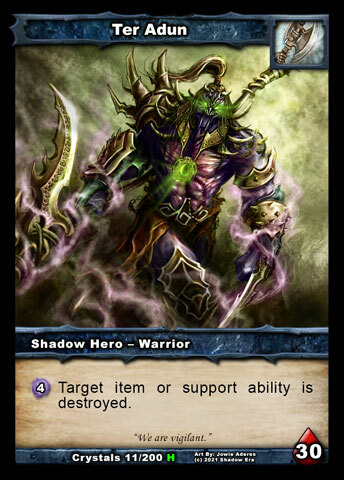 As an added bonus, this should boost the Ravager alignment with any Shadow Warrior, but we expect Ter Adun to get the most value from this in the same way that Jericho was boosted by Lingering Essence . If you're still reading now with those seven upcoming cards revealed, I'd like to take this opportunity to thank you for your patience since Lost Lands Part 1 was released, while you have been waiting for news of what would be coming in Part 2. This is the main reason that we are doing spoilers now, while the cards are still being tested and before they have artwork, so everyone can get them as soon as possible. The other reason for revealing now is to offer a better opportunity for you to get involved with shaping their final form - whether that be through your discussion of their expected gameplay impact or perhaps suggestions for artwork (which could even be your own!). - Each class will be getting 7 of their new class-specific cards in Part 2 (with 3 more in Part 3). - With Part 2 being 67 cards like Part 1, you can expect the other 18 cards in Part 2 to be faction-specific or neutral cards, including new weapons and armors. 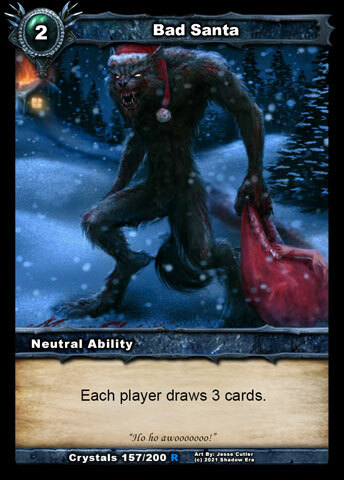 In terms of when these cards will be released on the live server, I can't give an answer at this time, because our main focus within the Design Team is currently delivering the Campaign mode, but if anyone is really keen to play with them, we will be opening the doors to the PFG again when this spoiler series is complete. Thanks for reading and I'll see you next time, where we will have the Hunters in our sights! Last edited by Gondorian; 11-18-2016 at 01:31 AM. I like all of the cards except Yari Plunderer . I dont see any deck he would be used at. 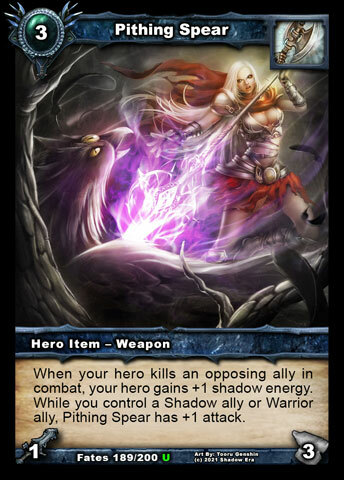 As said Yari decks seldom use weapons, and apart of that it looks more like a great ally for Gwen than any Warrior, since warriors dont have too many cards that restore durability. 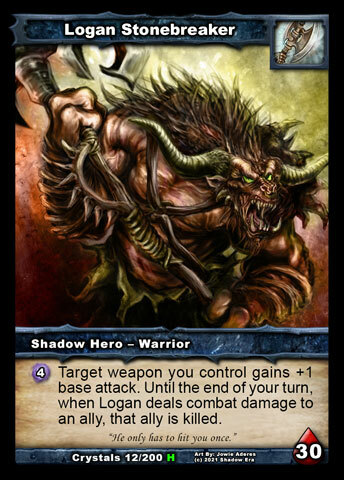 Only deck that could get anything of this ally is Logan to hit once with his ability, thats about it. Maybe make him get a weapon back into your hand? So he would be a Yari version of Lily . Looking great! Some nice tools for Logan , Rothem and Ter. "I was in the Virgin Islands once. I met Jasmine. We ate lobster, drank Piña Coladas. At sunset we made love like sea otters. That was a pretty good day. Why couldn't I get that day over and over and over?" NIce cards. I can see nice combos with GIANT. And the new braxonian guy is really strong for amber. I really liked. Ps: Nice adiction to ter adun, just plz, do the same for logan, raikka, dc and JERRY. 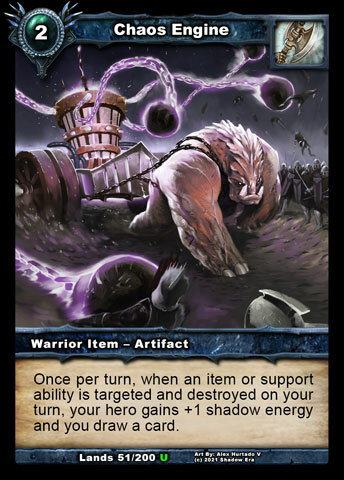 Actually Yari Plunderer is a very cool card. It gives a great body and on top of that a weapon for huge tempo-sings with logan and Pithing Spear for example. On top of that it gains Yari Bonus effects. 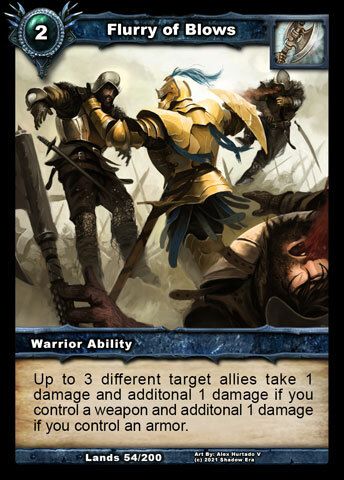 And finally it is usable in Ravager decks, which is amazing, allowing it to be in different decks. 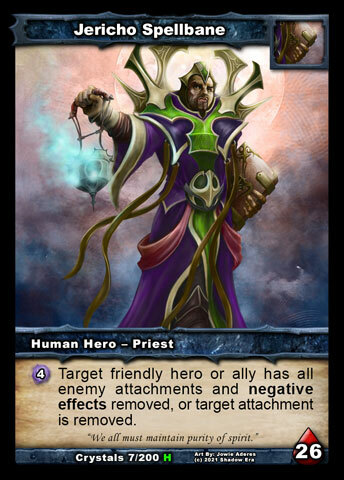 Loving the Ter Adun card. 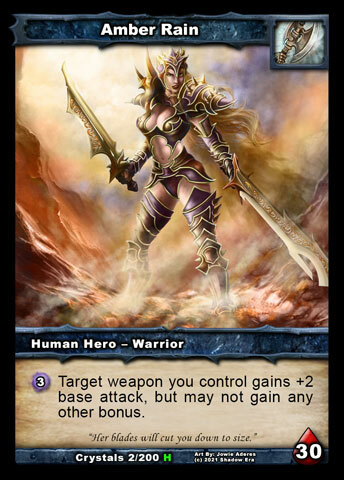 The other cards look alright, not sure if War Cry will replace any draw option Warriors have, Amber who could benefit the most rather likes Bad Santa as a draw option. If Plunderer returns JD he is basically 2cc 3/5...I wouldnt call that bad. Wasn't expecting spoilers yet, lol, but these are cool. Chaos Engine and War Giant seem especially fun. Weaponsmith will be Amber 's new best friend as well. Now I kinda wish you reach 23000 posts soon. 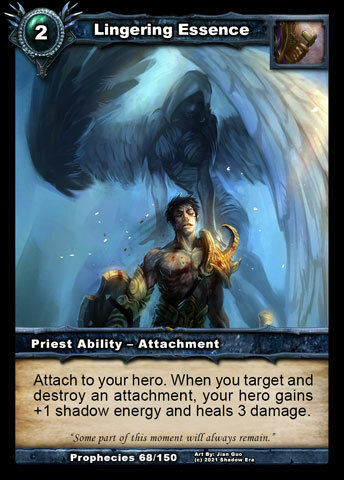 Good spoilers, all the cards are useful in some way or another. I can comment more on the cards only after using them.